Indeed. The pre-arrival directions had recommended we pack light. They had also advised us arrive on time because the innkeepers would be working with a particularly low tide that afternoon and wouldn’t be able to leave the harbor any later than 4:00 p.m.
We buckled our life vests and Che started the motor. Just outside the harbor, Jillian pointed out the remnants of an old shipwreck jutting out from below the water’s surface. She explained the ship had been part of a set from a 1950s John Wayne movie. Coming around the point, East Brother Island and its quaint Victorian lighthouse came into view. 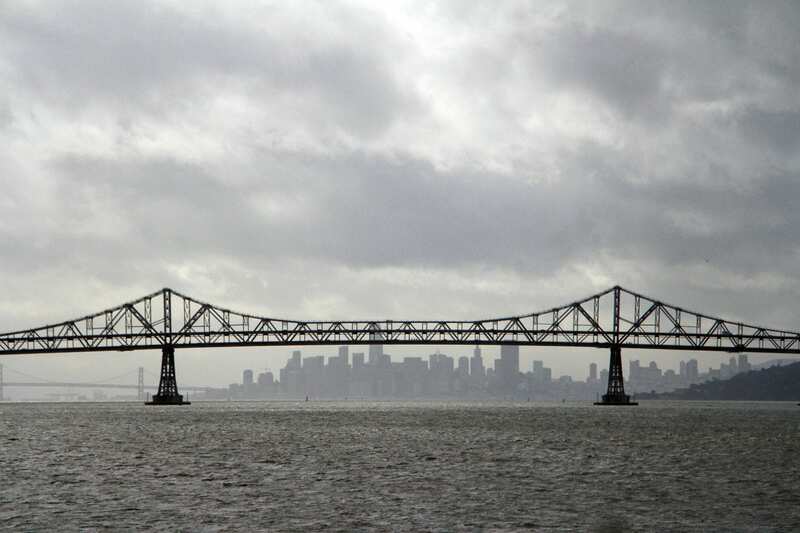 The island is one of two small, rocky islands in the strait that connects San Francisco Bay with San Pablo Bay. 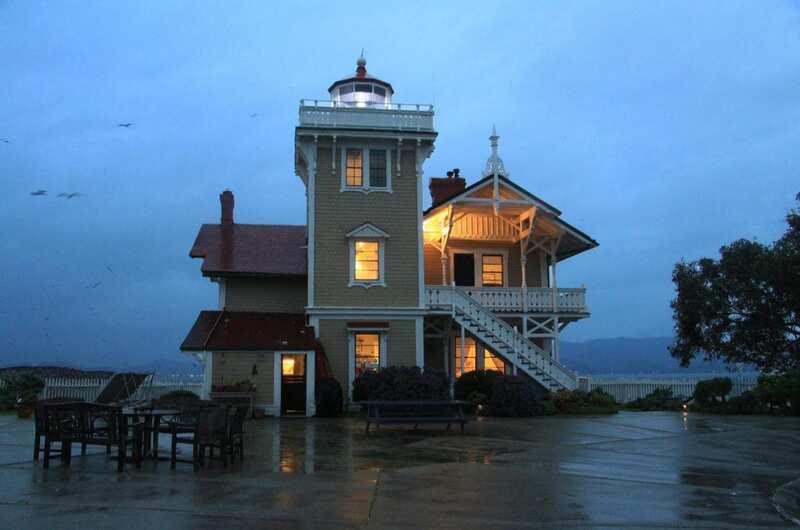 Built in 1874, the lighthouse and its fog signal have been guiding mariners through the waters connecting the bay with inland ports for 145 years. East Brother’s wooden lighthouse was the most common style of the 70 or so lighthouses built along the West Coast in the late 1800s. Today, it’s one of the last remaining of its kind. In the 1960s, the U.S. Coast Guard began replacing the lighthouses with automated beacons on steel or concrete towers to save on salaries and maintenance costs. The old wooden buildings were destroyed. 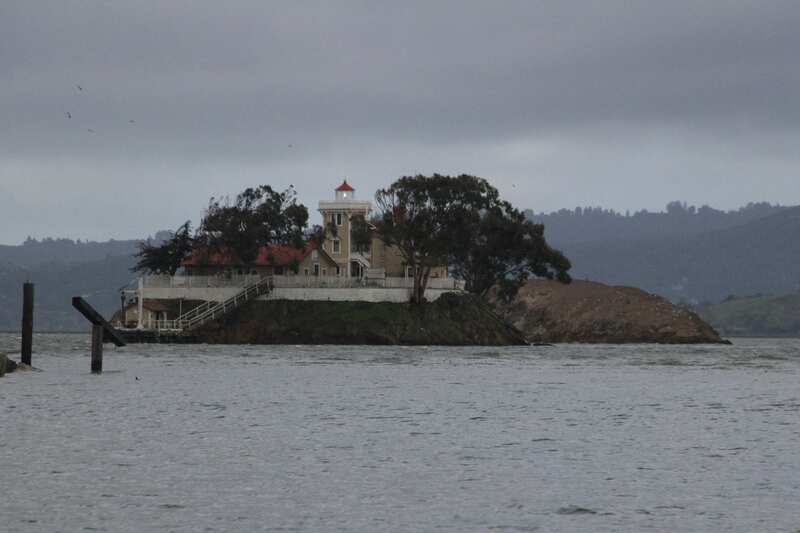 East Brother was slated for demolition as well, but the Contra Costa Shoreline Parks Committee stepped in and secured recognition for the lighthouse on the National Register of Historic Places. In 1979, a non-profit organization formed with the goal of raising money to restore the lighthouse and making it available for public use. 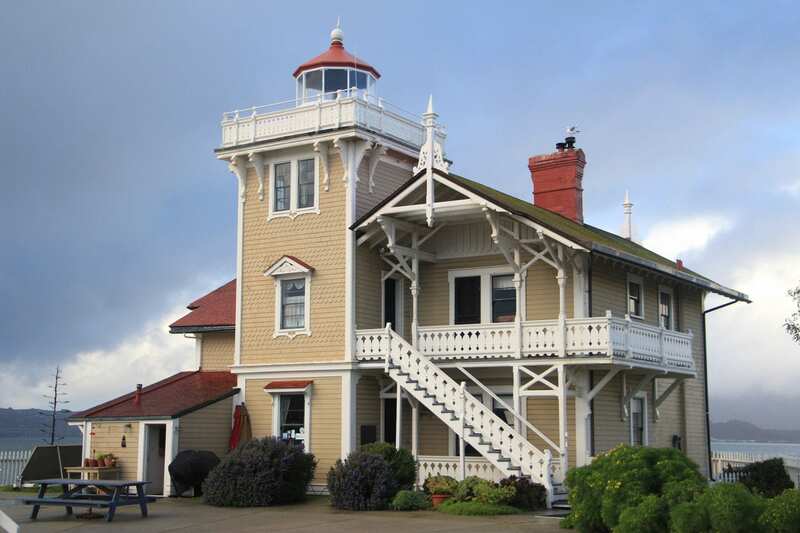 With the help of private donations and hundreds of volunteers, the lighthouse and other island structures underwent an extensive restoration and opened as a bed and breakfast inn in 1980. Funds collected by the inn pay for ongoing restoration and maintenance for the lighthouse buildings and equipment on the island. East Brother Island is just three-quarters of an acre in size. The currents between the island and the shore are swift, and at low tide during a storm, the channel can be rough. The afternoon we ventured out, the winds were blowing at 30 knots and there were four-foot standing waves in the channel. Che deftly maneuvered the boat around the waves. He and Jillian tied the boat to the wharf and each of us climbed a 12-foot ladder to the top while the boat bobbed below. Che hauled all of our bags up to the top while each of us absorbed the scene. The winds were howling, the seas raged all around us, and it was just beginning to rain. Through the fog, we could just make out the silhouette of the San Francisco skyline framed by the Richmond-San Rafael Bridge. The Victorian lighthouse with its flashing beacon rose behind a backdrop of ominous clouds. We were just a ten-minute boat ride from the shore, but we had been whisked away to a bygone era. 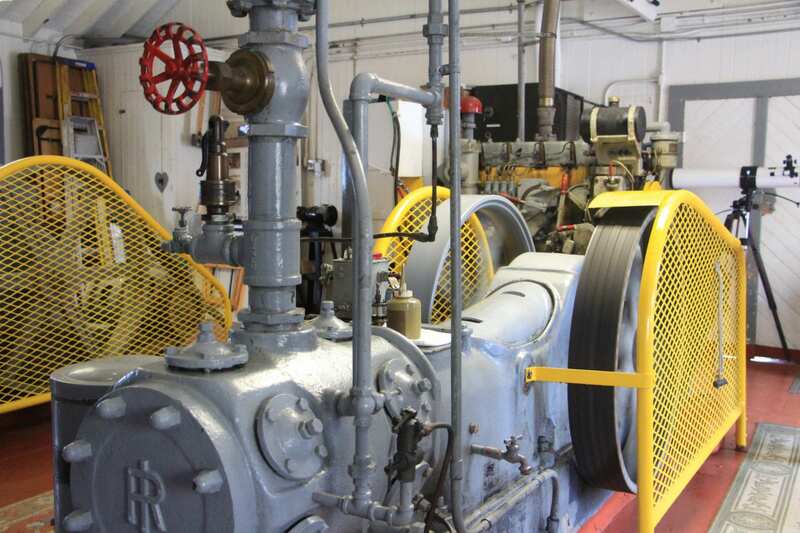 We toured the island and the original fog signal building with its 1930s-era air compressors and fog horn that were used to warn ships in misty waters. An electric fog horn sounds off every 20 seconds now, but Che fires the old compressors up a regular basis to maintain them and delight guests with the old fog horn’s sound. It’s a deep, mournful bellow that resonates to the bone. We climbed the narrow, twisting steps of the lighthouse tower. 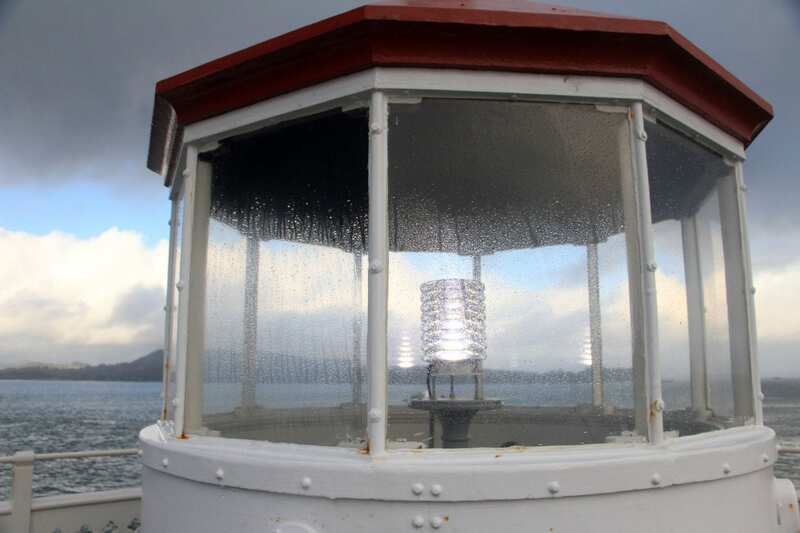 The lighthouse’s original Fresnel lens could be seen from 35 miles on a clear night. Between 1874 and the 1934, the lighthouse was manned 24-hours a day to keep the flame lit and shining brightly. The Coast Guard has since replaced the light with an automated LED beacon, but Jillian said they still come out every three months to giggle wires and ensure the light is in working order. We circled the widow’s walk outside the light while the wind and rain whipped around us. Distant city lights glittered along the shoreline. Inside, the lighthouse was warm and cozy. It’s a living history museum filled with books and vintage photographs detailing East Brother’s storied past. 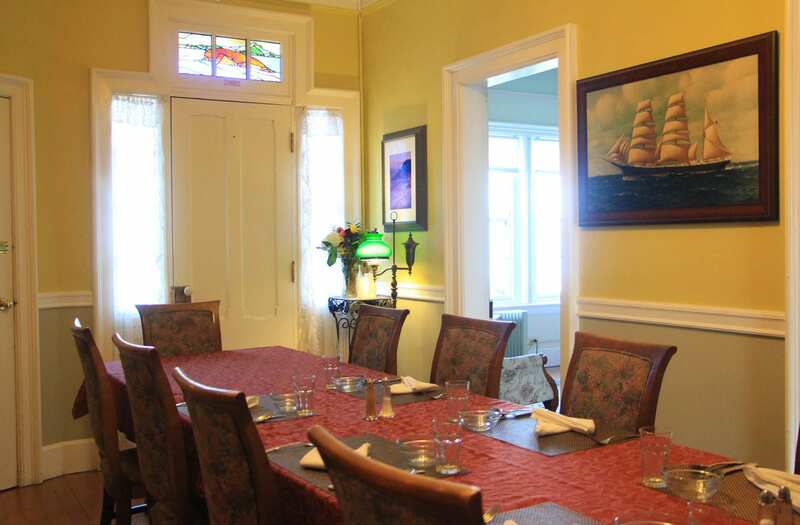 Four of the inn’s five guest rooms are located within the main house and one is located in the original fog signal building. 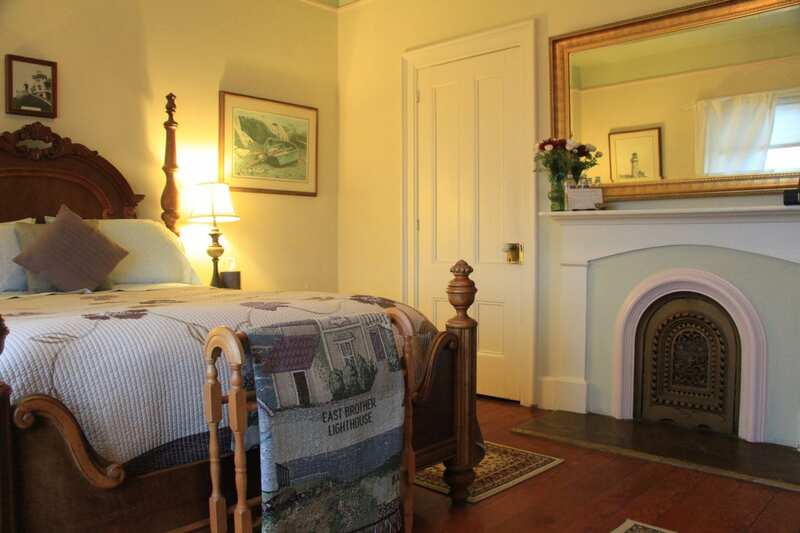 I stayed in the West Brother room on the ground floor of the main house. The spacious, high-ceilinged room features a large window overlooking West Brother Island (East Brother’s smaller twin, which is just a stone’s throw away), the Richmond Bridge, and the Marin shoreline. On a clear day, you can see Mount Tamalpais. During my stay, a multitude of shorebirds were riding out the storm on West Brother Island and gliding on the thermals between the two islands. 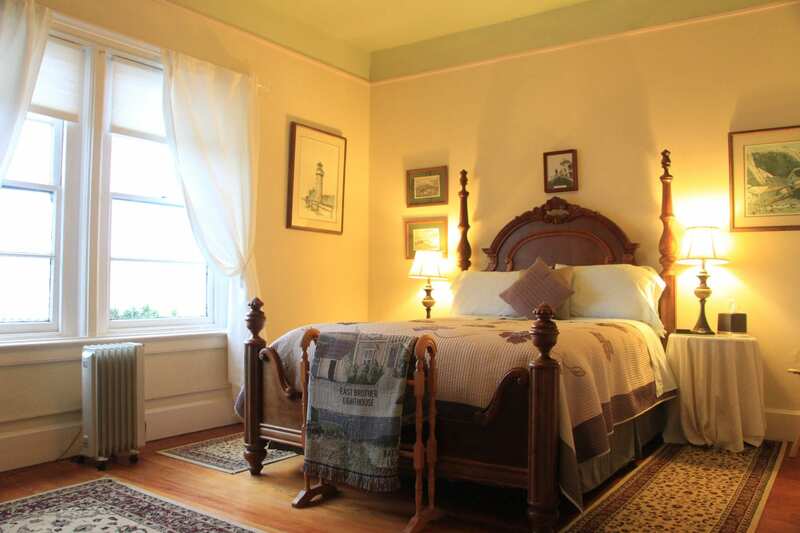 The room is decorated in a soothing pastel palette and furnished with beautiful Victorian high-backed settees and an antique, hand carved wooden bed. The queen bed was exceptionally comfortable and covered in luxuriously soft sheets. After we settled into our rooms, Jillian and Che built a fire in the parlor, served hors d’oeuvres and champagne, and regaled us with stories of the past and life on the island. Dinner was a lavish, four-course affair served with wine around a communal dining table. Throughout the night, I listened to the fog signal as the wind and rain battered the island. I marveled at the lighthouse keepers who lived and worked on this isolated outpost. While East Brother’s light and fog horn are both automated now, they still serve the same purpose of guiding ships through the strait through darkness and miserable weather. The island and its carefully-restored buildings shed light on the past and connect us to East Brother’s fascinating history.